The Water Bottle found in trash piles, and is used for the collection and transportation of drinkable water. To fill, equip it and right click while looking at a source of water. You can then drink from it whenever you desire with a left click (make sure the water in the bottle is freshwater and not salt/stagnant water). 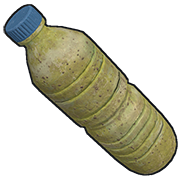 If the water in the pouch is not desired, or if you are attempting to extinguish a fire (not napalm), you can right click on the bottle again to dump it's contents.